Are you using SOLIDWORKS to its full potential? Enhance the CAD skills and capabilities of your team with a SOLIDWORKS Productivity Service from Javelin. Why Invest in your Team's Productivity? With a Productivity Plan in place users will have a consistent approach to making the best use of SOLIDWORKS. Your team can focus on design rather than researching new functionality. Users tend to work with the features they are most comfortable with, but we can bring them up-to-date with the latest SOLIDWORKS techniques. Providing training and developing team members increases morale and that in turn increases team productivity. 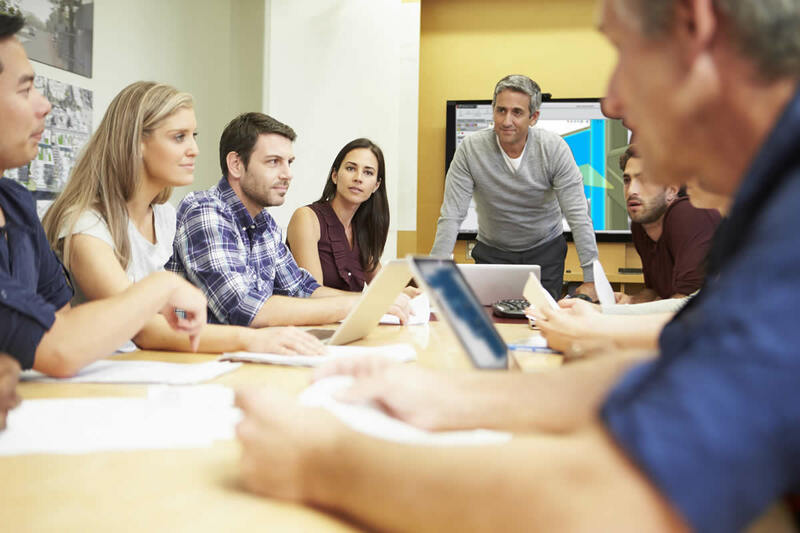 Employees tend to stay longer with a company when they receive training on a regular basis. Be more confident in your team's abilities with the knowledge that they are trained to use the software your business has invested in. Verify that your design process and team are as productive as they could be. Ensure that your software is being used the right way with team members utilizing the most effective methods and techniques. Prove to your customers that your team is proficient with SOLIDWORKS and able to deliver projects on time. A Javelin Elite Engineer will investigate how your business currently uses SOLIDWORKS software and assess your team's skills to determine where productivity can be improved and the training your team needs. 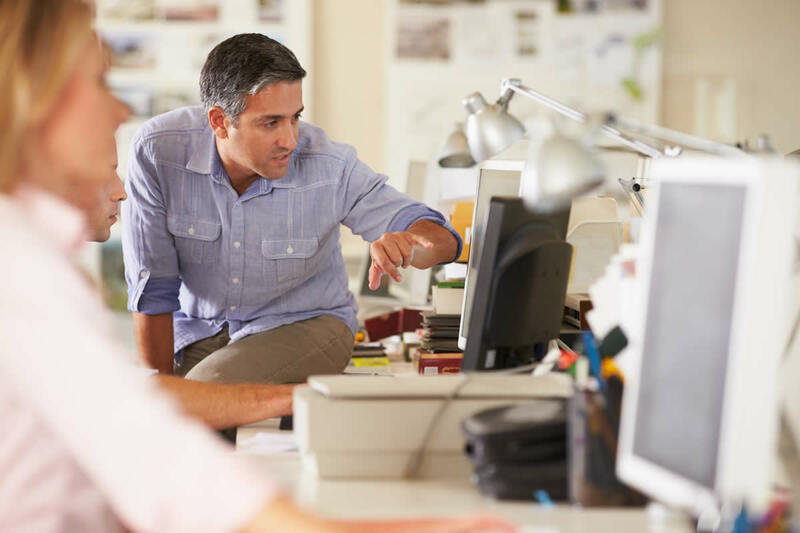 We will then work with you to create a tailored SOLIDWORKS training plan designed specifically for your business based on the analysis results. Tailored SOLIDWORKS training will then be delivered to your team either on-site at your premises or at one of our local offices. Training will focus on the features that will benefit your business the most. Followed by one-on-one sessions with individual team members to implement new techniques and provide targeted training identified from the needs analysis. After training has been completed we will meet with you to report our findings and results obtained from one-on-one training sessions. You will also receive a comprehensive report which contains recommendations to improve your business productivity and suggestions for further education to develop your individual team members. "I liked that I could learn things even in areas where I was already familiar. Some of the tips and tricks will help me do my job faster and more efficiently." "What I learned will make me more productive and make my company more competitive." — Ed Petruskavich, Island Automation Ltd. Investing in a Productivity Service from Javelin will dramatically improve your business. After receiving training our customers have realized a 75% increase in productivity because users know how to use SOLIDWORKS software more effectively. Able to reduce their design time. Have a consistent design approach. Work more effectively to create and reuse geometry. Stay effective with updates to the software. 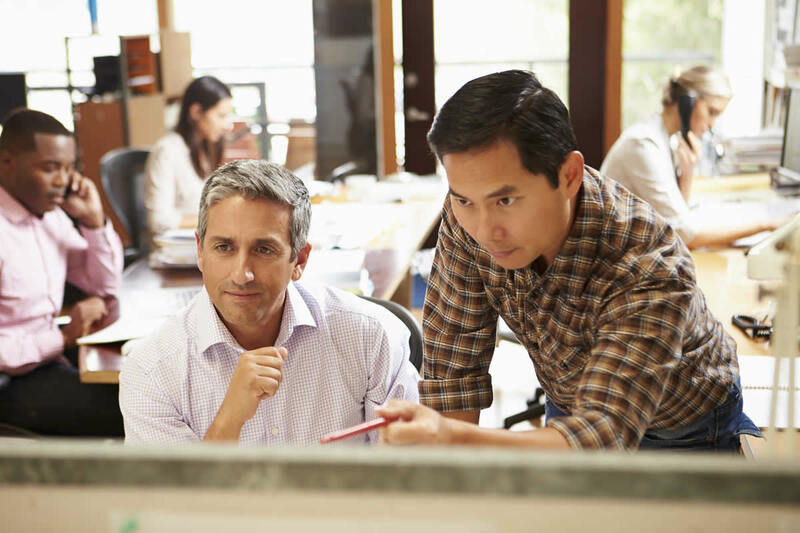 Maintain best practices in your business. A Productivity Service from Javelin will identify the most effective ways your business can use SOLIDWORKS. Users tend to work with tried and tested features they are most comfortable with, but we can bring them up-to-date with the latest techniques. Your team will also learn the enhanced functionality from previous SOLIDWORKS releases that they may not be using currently. The engineering team at Phil Mauer & Associates once suffered through slowdowns when working with large assemblies in SOLIDWORKS, until they got help from Javelin Technologies. Javelin’s specialists solved their problems and helped them increase their productivity when handling complex geometry by up to 5 times. Phil Mauer & Associates designs and manufactures material handling containers and racking. Customers provide data for a part or assembly in a neutral file format, then the designers use SOLIDWORKS to create a container for that unique product. Opening just one customer-supplied part was taking up to 10 minutes. To design the rack for the part, Phil Mauer's engineers do not need the full complexity of geometry supplied; most faces are irrelevant. During design, the software would stop responding for up to 20 seconds, resulting in distraction and frustration. During custom-designed Javelin training sessions, Phil Mauer’s designers gained not only deeper knowledge of SOLIDWORKS but also practical skills directly related to their real day-to-day challenges. They practised techniques that pinpoint the cause of slowdowns and learned how to eliminate them. Thanks to a Javelin-designed solution for eliminating the unnecessary geometry not used in the container or rack design, complex customer-provided models can be adjusted upon receipt in just 30 minutes, eliminating hours, even days, of frustrating stop-and-go work for designers. Analysis: During a full-day visit, a Javelin specialist watched designers work and discussed their challenges to fully understand their work and gauge the proficiency of each user. Custom Solution: Javelin discovered the bottlenecks, reported on findings, and designed tailored training for the team. Implementation: During training, Javelin focused on critical areas unique to Phil Mauer's challenges, while leaving room for brainstorming and collaboration with their team. RESULTS: User productivity increased by up to 5 times when handling complex geometry. One of our customers reported that building frames in SOLIDWORKS using Assembly techniques was very time consuming and when editing was required it would generate even more work. The customer wanted to know if there was a technique that could speed up the build process and allow changes to made easily. The user was building assemblies containing parts with similar profiles. Even though the process had been streamlined by using library parts, it would take hours or even days for a complete framework to be completed. Modifying the framework was even more time consuming using this technique. 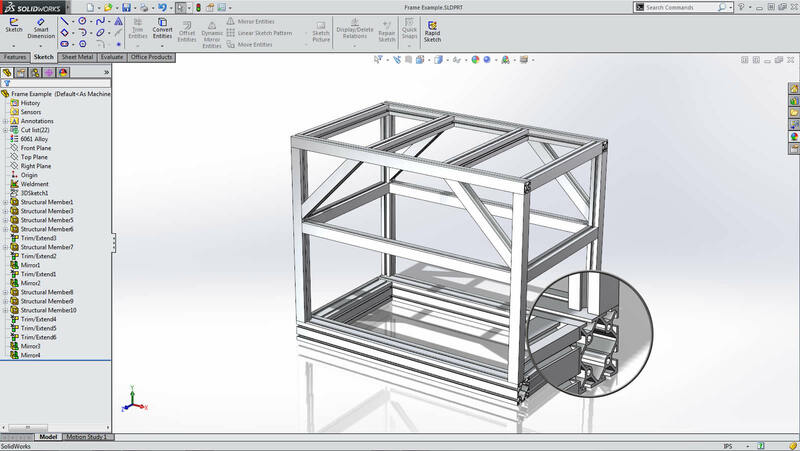 The user was aware that SOLIDWORKS has a weldment environment for quick and easy frame creation, however the user was not confident using it and had not received training. A Javelin expert assessed how the user was currently building assemblies and demonstrated a new technique to build the same assembly in a few minutes instead of hours. Starting with the creation of a weldment multibody part and followed by converting it to an assembly, complete with custom properties for each of the piece parts (including the ability to control overall sizes in parametric format). During an investigation into a customer's processes we noticed that the technique they used for adding custom properties to components in their assembly was very labour intensive. User was adding properties to assembly components by opening each part file one by one which is a very time consuming method. User was not aware of the advanced component selection functionality. The entire team was not using the Property Tab Builder for adding custom properties to components. A Javelin expert demonstrated a better technique for adding custom properties to multiple components using the Advanced Component Selection tool and the Property Tab Builder which allows for properties to be applied to multiple components at once. Once the process was established and the Property Tab Builder was set up, for a 100 component (unique files) assembly the time saving was many hours. Infinitely FASTER: Hours of work reduced to minutes.